The new Centre ~ CSWL ~ has been approved by the Academic Board of Birkbeck University of London as a School-level body in the School of Business, Economics & Informatics. 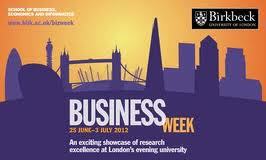 It was officially launched on Tuesday 25th June as part of Birkbeck’s Business Week 2013. The CSWL project now enters its second phase which must focus on establishing its position in the College and building up its funding and staffing. Following an introduction by Professor Philip Powell, Dean of the School of Business , Economics & Informatics, I presented a Keynote address on Sustainable Working Life in which I discussed the nature and history of the concept of sustainability in relation to work and working life and then introduced the new Centre. In doing so, I reviewed its initial Programme of Research. My Keynote was followed by a Panel Discussion modelled on the BBC’s Question Time. It was chaired by Professor Phillip Dewe, Vice Master of Birkbeck, who also provided concluding comments at the end of the event, see: http://www.bbk.ac.uk/news/birkbeck-launches-new-centre-for-sustainable-working-life. The Panel members included Declan Cunningham (EHS Executive Primark Group), Dr Malgozrata Milczarek (European Agency for Safety & Health at Work), Dr Juliet Hassard (CSWL) and Ceri Jones (CSWL). I joined the Panel to talk about CSWL’s involvements in the METIS Collaboration and in pharmaco-safety. Together the members of the Panel covered a range of issues relating to the Centre’s collaborations in areas such as: cancer survivorship and working life, safety culture in the retail sector, good practice in health and safety management, and pharmaco-safety. The session was well attended and the various discussions developed in a lively manner for over an hour. The launch of CSWL was followed by the Alec Roger Memorial Lecture which was given by Professor David MacLeod (see below). It was also well attended. There was then be a Reception with nibbles and drinks. The VIPs then retired to the Charlotte Street Hotel for dinner which was immensely enjoyable and eventually closed out just short of midnight. Early and varied feedback suggested that the whole day was a success. Our thanks must go to Rose Devaney, Radhika Karkhanis and their colleagues and also to Professor Linda Trenberth for their good work in organising the launch. This entry was posted in Uncategorized and tagged Alec Rodger Memorial Lecture, Birkbeck Business Week, Cancer survivorship, Centre for Sustainable Working Life, CSWL, Disaster, European Agency for Safety & Health at Work, health and safety management, METIS, Pharmaco-safety, Primark Group, Psychological intervetnions, research, Retail safety, sustainability, Sustainable working life, Working life. Bookmark the permalink.